One afternoon at about three o'clock, Peter and John went up to the temple. It was time for the evening service. They got to the gate of the temple called the Beautiful Gate. There they found a beggar sitting. He was lame and had never been able to walk. He had never taken a step! As Peter and John came by, he asked for a gift to help him. He could not work, so he begged for a living. Peter and John stopped and looked at him. Peter said to him, "Look at us." The man thought that they were going to give him some money. But Peter said, "I have no silver or gold, but what I have, I give to you. In the name of Jesus Christ of Nazareth, stand up and walk." Then he took the man by the right hand, and lifted him up. The man's feet and ankle bones were strong at that very moment. The man jumped up, and he walked with Peter and John into the temple. He praised God for healing him. All the people there saw him. They were amazed, because they knew this was the man who had been sitting and begging at the temple gate. They knew he could not walk. They crowded around to see. Then Peter began to tell the people about Jesus. 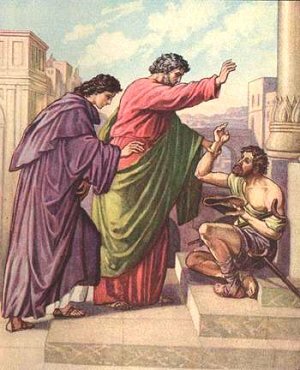 Peter had no money to give the lame man, but he gave him something better; healing. Some gifts are better than money. Sometimes we need to give people our time and attention and let them know we care about them. Suppose there are new children at your school, and they appear lonely and isolated. Which would be better, to go up and give them a dollar or befriend them and include them in the group? God worked through Peter and John, and God will still work through you today if you will let Him. English Bible Activities Select story #247 in the list for activities to accompany this Bible story. Spanish Bible Activities Select story #247 in the list for activities to accompany this Bible story. Press "Go" to search for books about Peter. This site provided wonderful activities for my students. It touched their lives. Overall, it helped me as a teacher to plan effectively. Thank You and God Bless. I am so thankful for this sight. I use it to make my lessons more fun and interesting for the kids in my class!! God Bless you for all you do!!! GREAT! I love this sight it is sooo helpful to me. God Bless You! Nice slideshow! You have such wonderful lessons. Thanks for all the work you have put into them. This page displayed 125,684 times.